Our Equine Science students quickly discover that opportunities for leadership through service abound and are frequently integrated into their classes. The Judson community is committed to service to our neighbors, and we believe that by partnering with our students in serving others, we help them develop more fully. One particularly popular opportunity for service-learning is available through our creative course in Animal Partnerships. 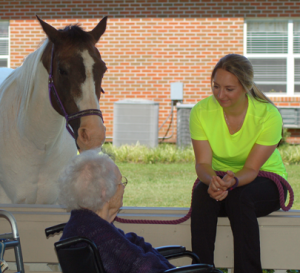 Students learn how horses can be partners in community service projects that benefit senior citizens, children, and people with special needs firsthand by visiting local nursing homes with Judson horses. Equine Science students also participate together in other campus-wide community service initiatives. Truly life-changing moments have resulted from the efforts given by our students on these special days.